We all take electricity for granted. Flip a switch, plug in an appliance, or twist in a light bulb, and everything automatically works, right? Yet a lot can go wrong with the electrical components in your home, as problems may crop up with wiring, circuit breakers, wall outlets, and more. These concerns can range from annoying to downright dangerous. They can also be costly, since many electrical problems are not covered by homeowner insurance. As a homeowner, you should know exactly what to watch out for around your home or it could be tough on your checkbook! Too much wattage in lights. Whether you use incandescent bulbs, CFLs, or LED light bulbs, it's important to have the right wattage. If you replaced a burned out bulb with a hotter one - perhaps to get more light - it can harm the fixture or nearby ceiling. Also,if a dimmer switch feels very hot, that's a sign you're using too high of wattage lamps for the dimmer). If you have recessed lighting that turns itself off, and later back on, that's another sign of higher-than-optimal wattage lamps being used, as this on-off safety feature is designed to prevent damage. Lights dimming. Do lights suddenly dim, perhaps when you use a major appliance like your dryer or microwave? That could mean your home wiring is insufficient. This potential fire hazard should be inspected by a qualified electrician. Faulty outlets. If a particular outlet in your house has trouble running items, and manipulating the cord at the plug tends to make an appliance go on and off, the outlet is probably worn out. Springy receivers inside the outlet, which hold on to prongs, may be bent from multiple use. However, if many outlets are affected, it could point to a poor connection somewhere along the electrical circuit, which is a bigger problem. Bare wires. Any bare wire visible on an appliance requires immediate attention, as it can cause a shock or electrical fire. Turn off the appliance, unplug it, and don't use it again until the wire is repaired (by a licensed electrician or the item replaced. An outdated system. If your home was built before the 1960's, it may not have current safety features, including three-prong receptacles or built-in GFCI (ground-fault circuit interrupters) outlets. Plus, any pre-owned house might have a hodgepodge of quick fixes - say, a wall unit might have been installed by a homeowner rather an a licensed professional. Additionally, aluminum wiring may have been used as a cost-cutting measure. Electric outlets and panels must have covers installed, and if small children are in the home, kid-proof those outlets. 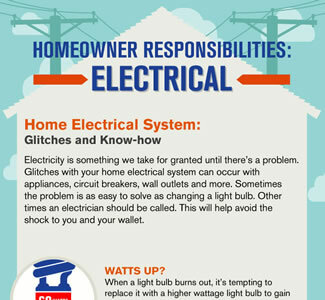 What other electrical hazards could be lurking in your home? Some might be visible, such as overloading outlets and too many extension cords. Others are likely hidden: box installation mistakes, the wrong insulation over recessed lighting, or a poorly-placed smoke detector. Sound confusing? That's why a licensed and certified electrician should inspect your home. Because what you don't know can hurt you - and cost you. Learn more about how to protect your home from electrical problems and yourself from sudden, unexpected home repair expenses by viewing our electrical protection plans or call us at 1-888-733-1683.